Data plate set, with rivets. Includes 6 plates and 24 rivets. AJP repro. These are the best plate sets avail today. Made in USA. Please note that we offer a stamping service too. We can stamp them exactly like the factory including the inspectors mark and correct font numbers. NOTE: This photo shows the master plate but this is not included for this price. Please see out SKU #WO 804225M if you want the assy. 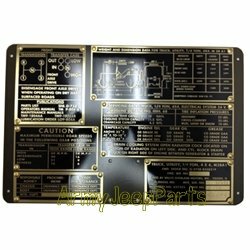 M38A1 Data plate set, with rivets. Includes 6 plates and 24 rivets. AJP repro. These are the best plate sets avail today. Made in USA. Please note that we offer a stamping service too. We can stamp them exactly like the factory including the inspectors mark (either Ordnance cross cannons or Eagle) and correct font numbers. NOTE: This photo shows the master plate but this is not included for this price. Please see out SKU #WO 804226M if you want the assy.